This is my new favorite hat! The knitting pattern I made is below. 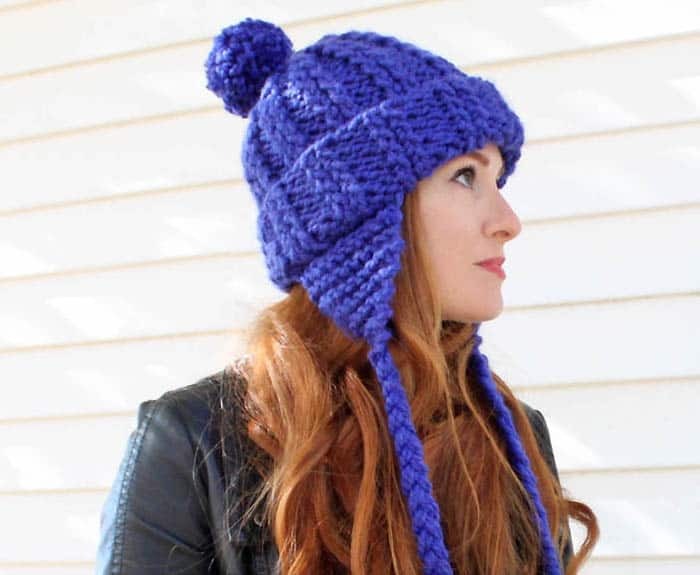 The large needles and thick yarn mean that you can knit this hat in an evening. Rows 1-26: Work 26 rows in k2, p2 Rib. Row 28: *K1, p2, k2, p2; rep from * across row. Row 30: *K1, p2; rep from * across row. Cut yarn, leaving an 8 in. tail. Thread tail through stitches of last row and pull to secure. Use the tail to sew the side seam together. Row 6 (Dec Row): K2tog, k6, k2tog – 8 sts. Rep last 3 rows twice – 4 sts. Next Row: K1, k2tog, k1. Rep last row once – 2 sts. Bind off. Cut 3 lengths of yarn, each 20 inches. Pull through the ends of the ear flap and fold over in the middle so you have 6 equal length strands. Divide into 3 sections and braid. Make a knot at the bottom. Trim ends. Fold up 3 1/2 in. for brim. Sew Earflaps to sides of hat. Make pom pom and tie on to top of hat. Weave in ends. Fantastic hat! That color looks lovely with your red hair! Is this knit in the round? Such a great and easy pattern! I just made this hat, without the earflaps, in just over an hour. I love it, thanks! Cute hat….. I would like to make a smaller version for a puppy . Any suggestions on what size yarn and needles? Hello! I made this for my husband. He picked out this chunky yarn 7 years ago, I've been trying to figure out what to knit with it (he wanted a hat) until I saw your pattern, I haven't touched the yarn. I started it yesterday, finished up up today, plus I had already made him a scarf using the same yarn, with the same ribbing a couple of months ago. He didn't want the ear flaps, so no ear flaps or a pompous. (I also did this hat on size 11 circular needles, casted on 49 stitches, when you join the two ends you do the first 1st & 49th stitch. It turned out super cute & easy. I will be making a second 1 for myself out of crimson & grey for myself & a matching scarf. is there an update because somewhere along I changed my numbers on the pattern and I dont recall why. Where you 48 stitches I have put 56 on rows 27 and 29 I have 42 stitches. for the earflap I changed it from 5 rows to 4 rows and made the row 5 the dec. row and rows 6 and 7 knit. if there werent any changes please let me know asap as I would love it for this horrible cold weather that we have now. Hi Sandie- There haven't been any changes made to the pattern since I posted it. Do you have any newsboy hat knitting patterns??? Not yet, but I'm working on it. I hope to have the pattern posted in the next week or so. I _LOVE_ this pattern. I just started to make a bit modified version of it. We don't have size 13 (9mm European needles) here in Finland, so I had to take the closest to that and change the amount of stiches a bit. I'll post you a link to my hat when I finish it.